How Are Coin Collecting Patterns Changing? Coin collecting habits, and the patterns with which we collect, have been constantly evolving over the decades. During the 1960s collecting was very much different than it is today, as it also differed from the 1940s, and the 1890s, or even the 2000s…right before the great recession. Incomes, sports and other entertainment, and even the monetary system are some of the underlying factors that influence the way people collect coins. But the most significant impact of late has been the great recession. Before that, it was the Internet during the 1990s, and before that, it was coin grading and encapsulation during the 1980s. Lately, middle class collectors have greatly curtailed the way they collect. This is because of reduced, or even the loss of, incomes and the fear of losing incomes in the near future, as well as paying down debts. Middle class money has also been diverted away from collecting coins in the traditional ways – by dates and mintmarks – into purchasing bullion coins and bars. Profit potential is a great driver of the reasons most people collect coins; and being so closely related to coin collecting, accumulating gold and silver coins and bars, has had a great appeal for many middle class collectors. And it’s worked out well for them. Prices for gold and silver bullion have been rising during the past few years, but this phenomenon has put a damper on traditional coin collecting by the middle class. On the other end of the spectrum, on the level of the wealthy, coin collecting has been expanding during recent years. Again, the profit motive is a great driver of this segment of the market, but as the wealthy investor of today has become more interested in collecting coins for profit, this end has actually brought many wealthy investors to the point of enjoyment in collecting. This differs from past years, such as during the 1970s, when investors, en masse, were throwing money at the rare coin market to hedge against rapidly rising prices in the overall economy, not really caring about the coins they were buying. 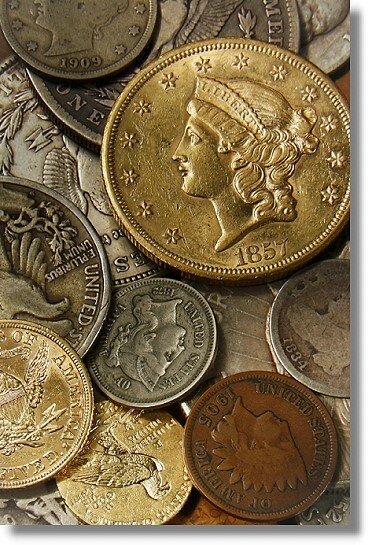 At that time, rare coins served as a great store of value asset, combating inflation, and that great influx of investor money, along with coin dealer profits from buying and selling bullion that were plowed into inventory, propelled prices for rare coins higher and higher within just a few short years. That could happen again, as the great debt load our country has undertaken results in another round of high inflation in the near future. Funny thing…life goes on as normal for most people these days; and most, including Washington politicians, are oblivious to what some economists predict is imminent – runaway inflation, to temporarily curtail another financial meltdown, like we saw in 2008. Many of the sophisticated wealthy get it, and that’s why they’ve sought out rare coins as one important investment alternative, to not only protect their purchasing power, as it’s expected to deteriorate during the next several years, but to profit on top of that loss of value. So what has all this done to change the patterns of coin collecting? This is really where the demand side of collecting as an investment is important – what will people be buying in several years time that will ultimately increase demand for particular rare coins and, hence, their price potential? One major trend has been moving away from traditional date and mintmark collecting, at all strata of the market, to collecting by design types. In some regards, this trend takes appeal away from some of the rare dates, and could possibly reduce the profit potential for some of those kinds of coins. As prices rise, fewer people can afford to collect them. And this is true for higher grades of some coin issues also. This effect has been greatly felt in collecting gold coins, for example. One area that has been impacted, for instance, are Saint-Gaudens $20 gold coins in MS 64 and MS 65. Price premiums have fallen substantially for those coins during the past couple of years, especially as the price of gold bullion has risen so dramatically. Ultimately, who’s going to collect them? Or is this really an investor-driven segment of the market? Probably. But, ultimately, collectors have to be the ones to drive demand for a coin investment to really work. Typically, as prices rise over the long haul, collectors lower their expectations of grades they can afford, or want to buy. A good example of this is in the collecting of early silver dollars, struck between 1794 and 1803. Where some collectors used to go after Mint State coins, they are now going after About Uncirculated or Extremely Fine graded coins that exhibit just a little friction on their high points, or light wear. Several years ago, some accomplished collectors of this series just sold out and went into collecting other areas because prices rose too high for them. Back on the other end of the spectrum, where collectors find coins in change, evolving collector trends have been obvious. Back in the 1960s collectors could still find silver coins in change, and often better dates. When the clad dimes and quarters were introduced, it changed forever the way average Americans collect coins. For many years after that, there was really nothing interesting to find in change, so the next generation of coin collectors didn’t materialize. Finally, many years later, people had a much larger range of dates and mintmarks to once again pull from change, and interest began growing again, especially when the State Quarter program was introduced. Of course, the Internet and video gaming also had a huge impact in diverting young people away from collecting coins. But ultimately, the Internet has helped the coin market flourish. It has given busy, sophisticated, wealthy investor/collectors a great resource to learn about and research coins. The Internet has also facilitated coin trading and the auction market. It has brought collectors together in online clubs and forums. So, when you’re planning out your collecting and investing endeavors in rare coins, these changing trends and collecting patterns are some of the considerations you might want to think about. Who will be the ultimate buyers of the coins you collect and invest in? What will make prices rise? These are probably questions that are in the back of most collectors’ minds as collections are built. Virtually all coin collectors want to at least get their money back from the coins they buy, but most ultimately want to profit from their collecting endeavors. What thinking has gone into your coin collecting/investment plan?